The world’s leading airport exhibition, inter airport closed with a record number of visitors this year and the show in Munich was undoubtedly our busiest yet!The ADB SAFEGATE exhibit area with our ‘Time to Integrate’ showcase drew thousands of visitors. Feedback was extremely encouraging with most visitors stating that demonstrating the benefits of integrating Tower, Airfield and Gate into one interconnected solution, was just the kind of innovative solution they have been looking for. Feel free to contact us at any time to discuss how we can help improve your airport’s operations and cut costs while maintaining safety. VIDEO. inter airport Europe 2017. 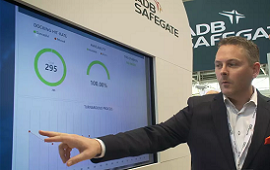 Join a guided tour around the ADB SAFEGATE stand where we showcased integrated solutions to help airport boost performance. At every stage of the aircraft´s process from approach to departure, integrated solutions can achieve time savings to reduce the total amount of time aircraft spend on the ground, as well as improve the efficiency of airport resources to decrease costs. 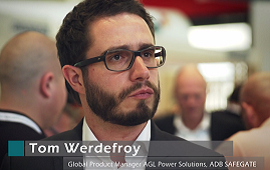 Watch Ieyasu Sugimoto, Global Product Manager ATC Solutions, explain how ADB SAFEGATE´s integrated airport solutions can help optimize operations and increase throughput. VIDEO. If you a need a better view of what’s happening to aircraft at your airport, take a look at our new data analytics tool. A dashboard based visual aid, it shows clearly how all the elements of the airport turnaround process are working together and how their integration can be improved.The new data analysis solution provides airport managers with new insight into how well operations are running. The system reveals operational performance related to the airfield, tower and gate, such as aircraft docking times and on-time turnaround performance for departure. Operators can now more easily see and fully understand what is happening, how they can improve efficiency and what solutions can be implemented to increase airport and airline performance. VIDEO. Do you want to improve safety and efficiency on the apron? Then see our video on our Pushback Support Tool that simplifies air traffic control workloads by suggesting and monitoring aircraft pushback procedures. 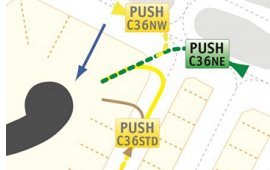 The tool automatically suggests the optimum aircraft pushback routine, monitors the pushback procedure and warns ATC of potential conflicts with other aircraft or vehicles in the apron area. 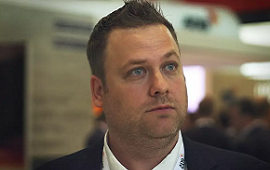 Watch this video where Rikard Larsson explains how our LED and 2A solutions are making huge energy savings for airport customers. With the installation of the 1.2 millionth LED AGL fixture globally, ADB SAFEGATE has achieved a key milestone in airfield ground lighting (AGL). 750 airports and two out of three LED airfield lights globally are based on ADB SAFEGATE’s leading LED technology, showing how airports everywhere have switched to this energy efficient lighting technology. ADB SAFEGATE offers the only full LED portfolio of lights and visual aids proven to deliver energy and other cost savings adding up to millions of euros annually. 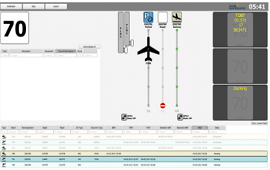 We’ve also added advanced new features to our Safedock visual docking guidance system, so you can increase the number of aircraft your gates can handle.The enhanced Safedock A-VDGS integrates docking, gate and apron control, surveillance and monitoring systems to improve the efficiency and accuracy of aircraft gate arrival, turnaround and departure. Safedock also helps to enhance apron situational awareness and safety. The system is built on the experience and expertise of ADB SAFEGATE, which has supplied more than 8,000 docking systems worldwide. Our new Power HF solution is 33% smaller and 30% more efficient than conventional power systems. The Power HF range uses innovative transistor technology to achieve its compact size. Three or more Power HF units can fit in the same space as a single conventional 6.6A CCR. This reduces overall CCR substation size and simplifies installation and maintenance. The transistor technology also delivers dynamic and precise power regulation that boosts energy efficiency by up to 30%, reducing the total cost of ownership of airfield ground lighting still further. Airport efficiency starts by understanding every aspect of the elements that cut congestion, decrease downtime and boost safety. With one of the industry’s most extensive airport operations product and service portfolios, backed by deep operational know-how, ADB SAFEGATE help airports achieve the necessary integration of tower, airfield and gate systems.Read about our latest developments to help substantially reduce the amount of time aircraft spend on the ground, all while maintaining the highest safety.